The Office of Alcohol Control Committee, Department of Disease Control, Ministry of Public Health issued a declaration today that this type of clothing violates the ban on alcoholic beverage advertising. People wearing this type of clothing are eligible to the same punishment as entertainment venues advertising alcoholic beverages or cigarettes. Alcohol﻿﻿-related accidents have increased significantly in recent years. While the government makes 70 billion baht income p﻿er year from alcohol tax, the cost to the government is upwards of 150 billion baht. 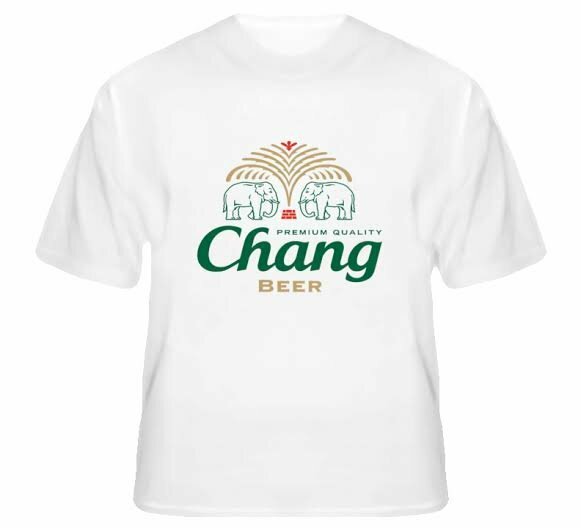 People cannot wear T-shirts with alcohol logos. Alcohol logos – or even images accepted as representative of brands, such as a deer head for Benmore or red stars for Heineken – are not allowed to be displayed in sponsorship or any kind of advertising or promotion. Promoting alcohol through word of mouth is also illegal, so if a person is asked to recommend a particular brand of beer he would be breaking the law if he responds. All printed photographs of glasses or bottles in the media must have visible brands and logos blurred. Fines range between 2,500 for non-cooperation with inspectors and a maximum of 500,000 baht for promoting and advertising alcohol illegally. There are also punishments of up to six months in jail for various offences. Foreigners violating the Alcohol Control Act of 2008 also risk a lifetime ban on entering the kingdom. Oh shut up you idiotic control freaks. And get on with dealing with the ruined health of the millions who are being poisoned by the catastrophic air pollution in the north. Trying to impose petty mind control measures like banning logos is simply a metaphor for the overbearing attitude of a ministry that is bereft of real and practical measures to protect the health of the people. Oh no... What will the Pattaya Bar Stool Elite wear on the 'A Go Go Airlines' flights if not a Chang Vest ? Maybe you won't need the chill pill. That s 2 obvious ones so far. This is getting silly now, I drive around in my car advertising Honda do I need a work permit? Damn beer always gives oi an 'eadache. A coup (no government), air pollution, endemic corruption, transportation and road problems, education is a mess, hiway road deaths, epidemic issues managing garbage, plastic everywhere including the oceans, overbuilding, lack of green spaces, feral animals roaming city streets, methamphetamine crisis. Sometimes i think It's april 1st in Thailand everyday. I think we are looking at a new revenue stream along Sukhumvit! So you can't watch movies where people are smoking or carrying a gun. You can stand next to a smoking gun-carrying cop on any street in Thailand.